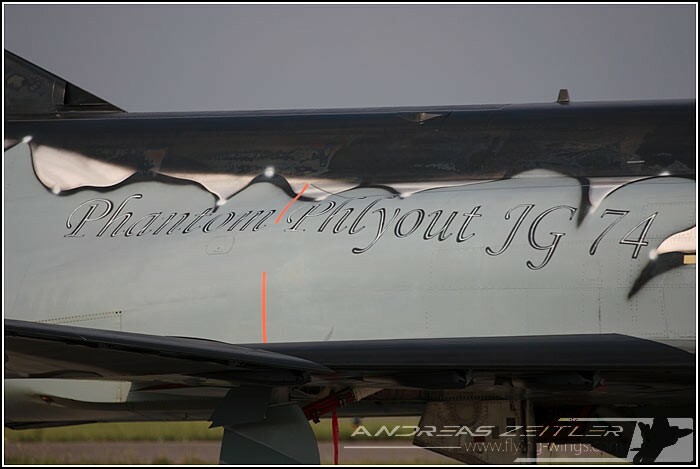 "The Farewell to a Legend", with these words the wing commander of Jagdgeschwader 74, Andreas Pfeiffer, opened its speech due to the decommissioning of the, meanwhile legendary, F-4F Phantom II. 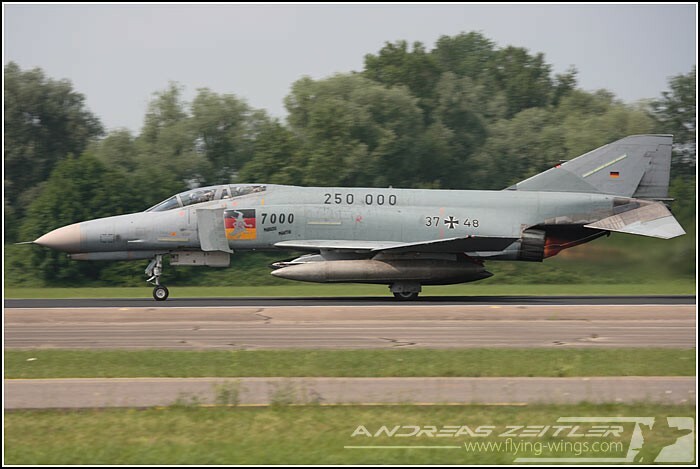 Nearly 34 years ago, on September, 26th, 1974, the first aircraft arrived at Neuburg from Wittmund, which will also be the airfield where the last 10 Phantoms will leave to as soon as possible. 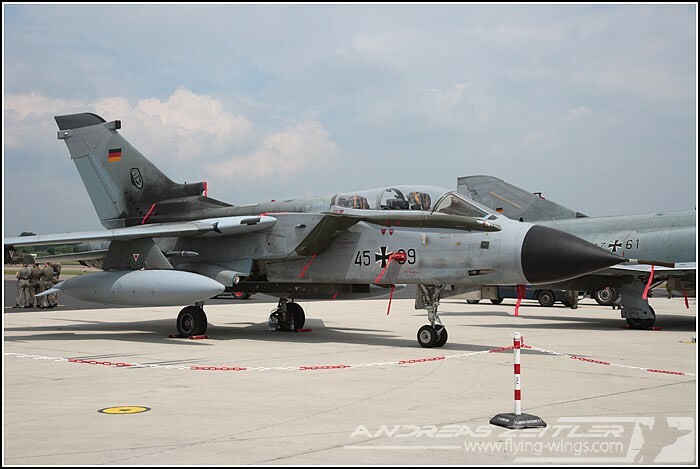 During all these year JG-74 flew more than 240.000hrs on the Phantom, among these more than 7200 on the aircraft 37+48. All these and even more impressive numbers were mentioned at the roll call. 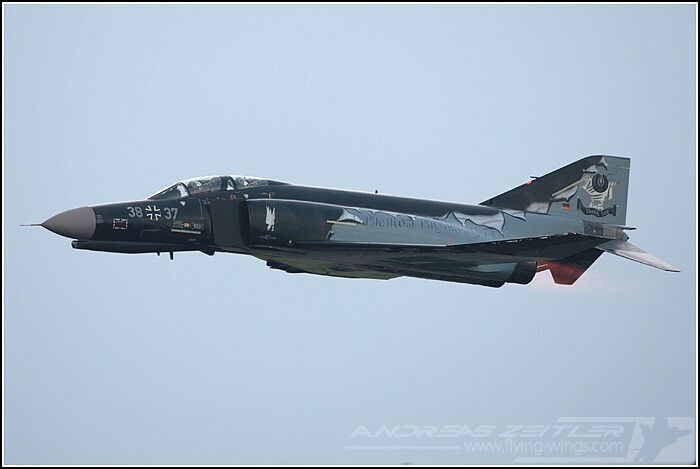 Besides the active personal many former members of JG-74, many of them connecting their entire service at the Luftwaffe directly with the Phantom, attend the event as well to say Pharewell to the F-4F. 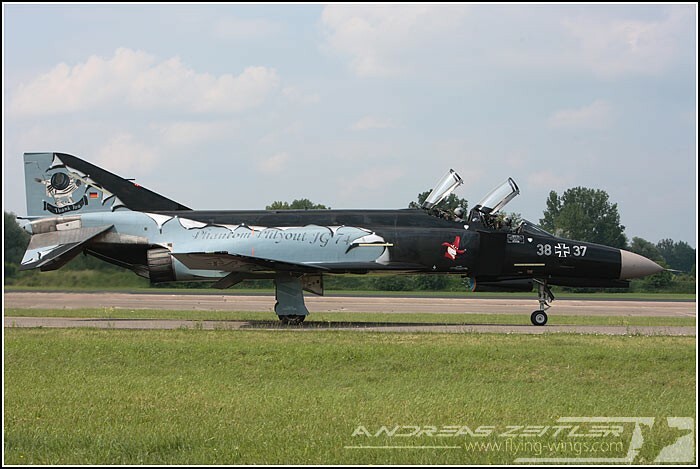 The Phantom 3837 (c/n 4716) has been chosen to wear the special scheme for the Phlyout ceremony. 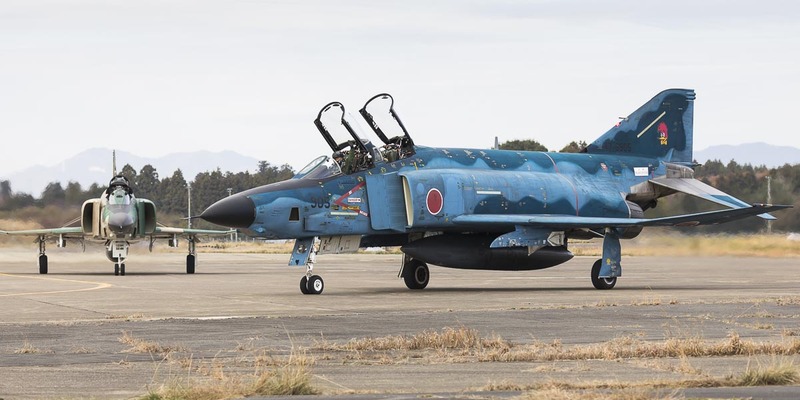 It is based on the standard camouflage of the German F-4F with the gray scheme apparently coming out of a black aircraft. On the tail Spooky takes a bow and is saying "Thank you", which obviously goes from the jet to the crews and pilots but can be interpreted also of course in the other way. 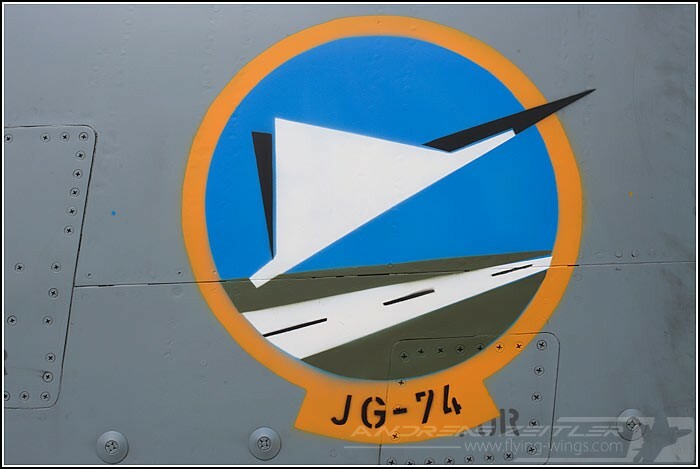 Both fuselage sides are showing the words "Phantom Phlyout JG 74" and the sides of the intakes show the emblem of the two Neuburg squadrons: the Falkenstaffel (Falcons / left) and the Zapatas (right). Spooky is also placed on the underside, accompanied by "PHANTOM - Job well done" as well as the JG-74 emblem. 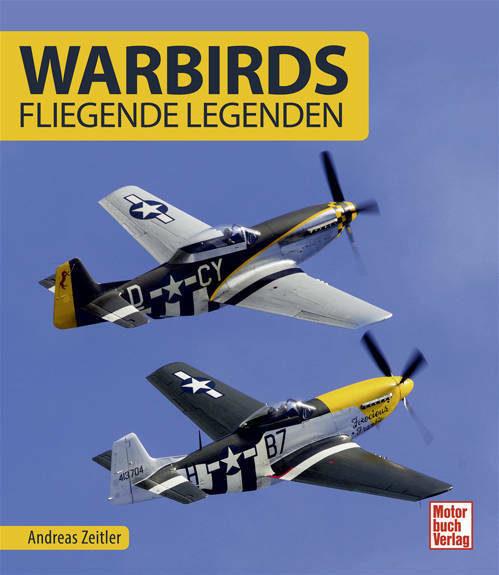 The aircraft was designed by Maj. Keller, Phantom pilot at Jagdgeschwader 74. 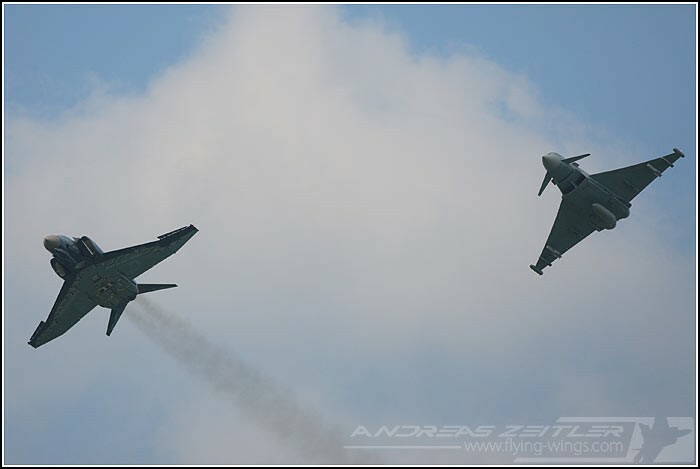 The farewell flights consisted of several formations as a Eurofighter together with the special painted Phantom, a 3-ship of Phantoms and finally a phorship of F-4F Phantoms, including the special marked jet celebrating 250.000 flight hours of German Phantoms. Especially the 4-ship left its distinctive smoke trail on the horizon, a sight that will not be seen in the future at Neuburg anymore, but surly not forgotten! 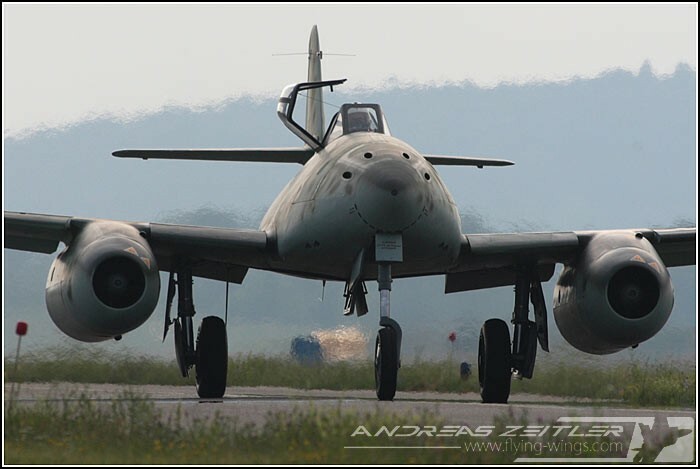 One aircraft also attending the event was the Messerschmitt Me 262 rebuild from nearby Manching, which was a nice sight during the take-off in the evening to return to its nearby homebase. 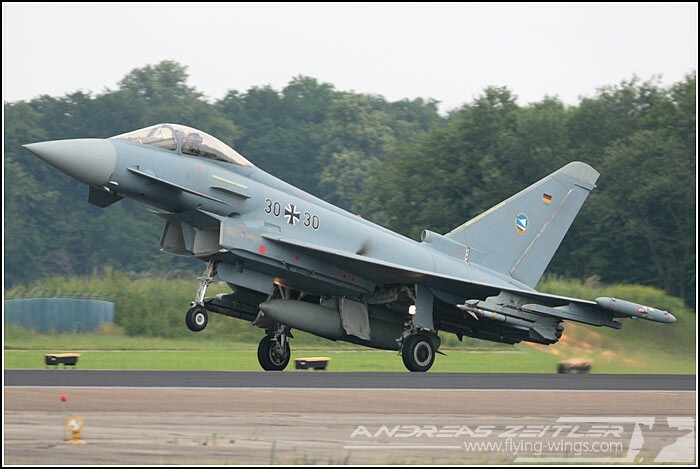 "The king is dead, long live the king", another quote of the speeches that day, referring to the Eurofighter Typhoon, which officially took over that day the NATO QRA duties from the F-4F Phantom II. 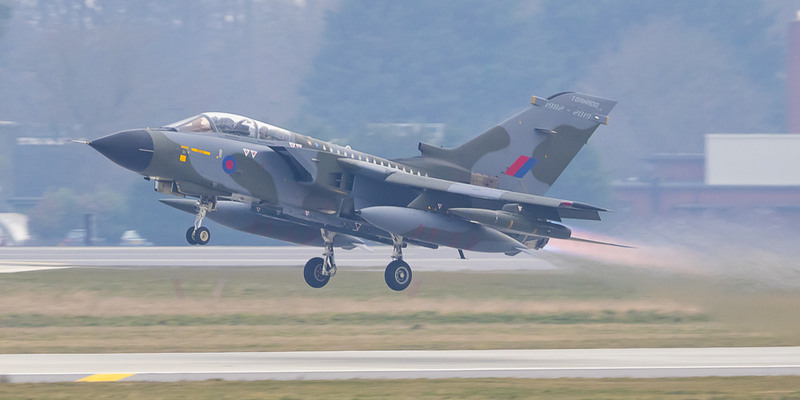 Armed with two live AIM-9L Sidewinders and an external tank two jets took off at 15h00 for an QRA-scramble to herald this new era of jet flying at Neuburg. 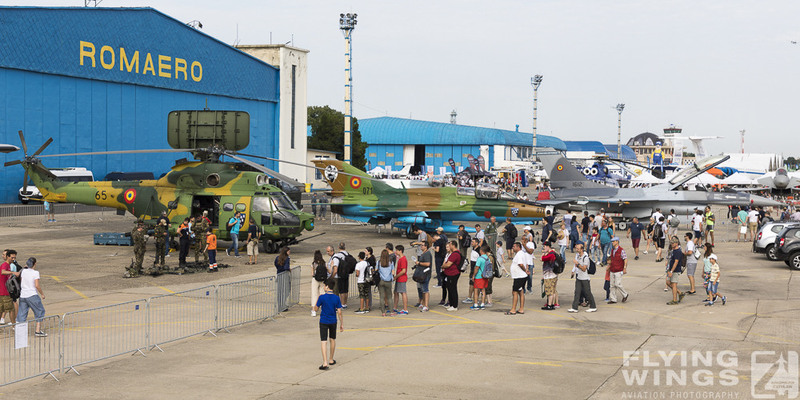 Furthermore the event was enriched by a small static displays of several foreign aircraft, whose aircrews also attended the event. 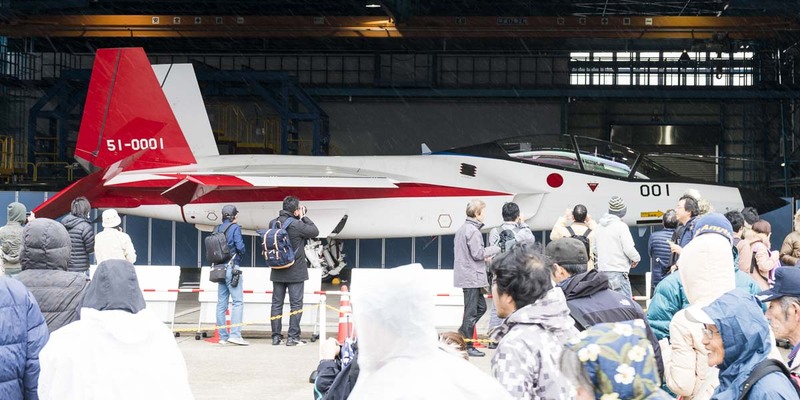 Unfortunately a lot of the, sonetimes also special marked, jets were parked out of reach of the cameras. More about the daily activities and the transformation phase at JG 74 can be found in the On Base Section.